[UPDATE 2, 2:58PM:] Good news, everyone! GameStop Italy and our U.S.-based source have both said that this was all a glitch in the system and that Watch Dogs is—or will soon be—available for pre-order for Wii U again in Italy and the U.S. Apologies for making everyone nervous about this and for not getting that all sorted prior to publishing the first time. First came the rumor of it happening in Italy, but it's happening in the U.S., too, according to a reliable Kotaku source: gaming chain GameStop is canceling pre-orders for the Wii U version of the anticipated, delayed, multi-platform Watch Dogs. That's not a good sign. Is the Wii U version of the game cancelled outright? Not coming out at all? We don't know. When asked today, a Ubisoft rep declined to comment. 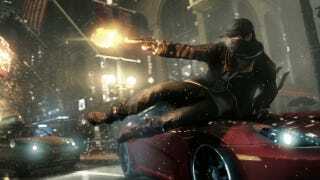 What we do know is that GameStop will still let consumers pre-order Watch Dogs for the Xbox One, PlayStation 4, PC, PlayStation 3 and Xbox 360. The game is still even available for Wii U on GameStop's website, but our source explained that stores in the U.S. have been instructed to tell customers who pre-ordered the game on Wii U to shift their pre-order to something else or to have it cancelled. It is possible, it must be noted, that Watch Dogs for Wii U could be restored to GameStop's systems, but that doesn't really track with the company trying to vacate pre-orders. Watch Dogs is a much-ballyhooed open-world Grand-Theft-Auto-style game about a hacker in Chicago from Ubisoft Montreal. The game that debuted at E3 2012 and was so visually impressive that it was presumed to be targeted at the then-unannounced next PlayStation and Xbox. The game was eventually announced for those new machines, but also for the PS3 and Xbox 360 as well as for the next-gen Wii U which runs closer to the power levels of those legacy Sony and Microsoft machines. The Wii U has had flagging third-party support, but has been able to count on good efforts from Ubisoft that have included the last two massive, open-world Assassin's Creed games. Watch Dogs is one of the few third-party games announced for the Wii U in 2014. By comparison, Nintendo has promised a raft of first-party Wii U games slated for 2014, including sequels to Mario Kart and Super Smash Bros.
Frustrating as potential cancellation of Watch Dogs for Wii U might be for Nintendo console owners, it's been clear for a while that the PS4/XboxOne/PC versions of the game are the ones worth paying attention to, and that the versions running at closer to last-gen power have not looked too hot. If we find out more, we'll let you know. NOTE: The original headline for this story—GameStop Is Canceling Watch Dogs Wii U Pre-Orders. Uh-Oh.—has been changed since it has proven to have been a matter of a computer mistake on GameStop's end. The game is not cancelled, not even at GameStop.